The BlackBerry Curve 8320 in Sunset is enabled for Unlimited HotSpot Calling from T-Mobile (previously called T-Mobile HotSpot @Home) offering great mobile coverage and unlimited calling over any accessible Wi-Fi network and at all T-Mobile HotSpot locations across the country. When leaving home or a T-Mobile HotSpot, calls are seamlessly transferred onto T-Mobile's wireless network, and the same is true for transferring calls from T-Mobile's network onto Wi-Fi. 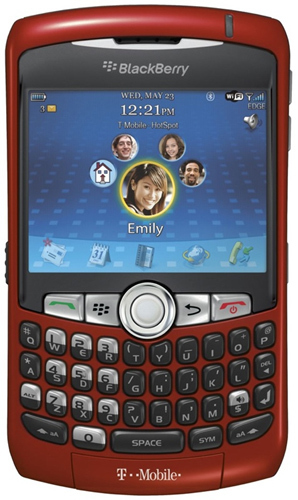 The BlackBerry Curve 8320 in Sunset includes a 2 megapixel camera, music and video multimedia player, a microSD expandable memory slot that supports up to 4GB of memory and stereo Bluetooth® as well as HTML Web browsing at Wi-Fi speeds, personal and corporate email and built-in spell check. It will be available at select T-Mobile retail stores and online at www.t-mobile.com for $149.99 with a two-year service agreement. Anybody reading going to pick one of these bad boys up? Or are you holding out for a new model BlackBerry? Let us know in the comments!